Unfortunately, the dress you are looking for (Style: AL-HL-262, Name: AL-HL-262) is no longer available. Look pretty in pleats with this long v-neck prom dress by Harper and Lemon. 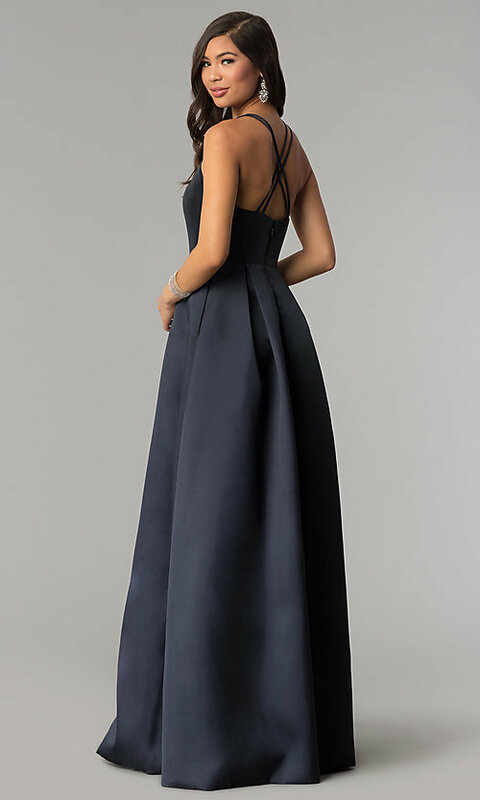 The gorgeous formal evening dress is fashioned from gleaming satin and elicits elegance with every detail. 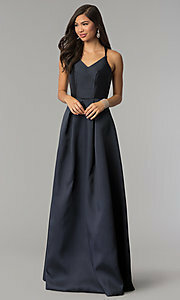 The subtle v-neckline keeps the bodice interesting while maintaining modesty with a higher cut. Offering contrast, thin double straps gently support either side of the a-line prom dress, crossing over the back in an eye-catching style. Adding unique style to the long v-neck prom dress, the sleeveless bodice displays seams that curve in towards the cinched waist. Here, an a-line skirt with full box pleats and pockets defines the figure to finish the formal evening dress with grace.